Up to 350 (Inside the barn is 200 ) Attached covered deck seats 150 people. YES! We do not make it mandatory to use caterers from our referral list. Dealing with a full service caterer will make your life easier, as we do not have a kitchen that food can be prepped, cooked, sliced, diced , etc. If you go through a company that simply delivers the food and only mans the buffet, you must think about the rest of the evening helping your guests as well as making it easier to cleanup for you at the end of the night. You need to consider servers to clear dishes, refill water glasses, clean tables, empty cans, etc. who typically stay long after dinner. Many times the amount of money you paid per person for meals that you had to pick up yourself or that just came in pans with no dishes, cloths, servers etc. is about the same price as the full service companies. Yes! It is rare that a facility allows you to bring in your own alcohol. We allow you to do this but we also have reasonable policies and guidelines if you are serving alcohol. See full information packet below. WHAT DO I NEED TO DO TO BOOK MY EVENT? STEP 1: Put it in writing! Send an email to hanawalt5@msn.com stating that you want to be put on books including the date and venue. STEP 3: Fill out contract and mail back with deposit. WHAT IS INCLUDED IN THE RENTAL OF THE ROOM? IS THERE HEATING AND AC IN THE BARN? The barn does not have central air or a furnace. However, there are six commercial air conditioners, window air in bridal room, giant exhaust fan in bathrooms and barn slider doors create a comfortable air flow through the room. In cooler weather brides may use our two patio heaters but should bring in any additional heaters (turbo/propane style) if it's cold. 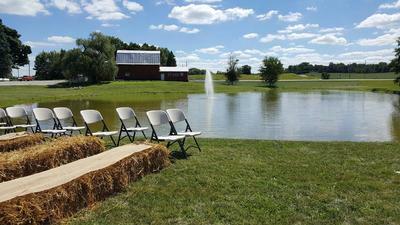 CAN I HAVE MY CEREMONY AT THE BARN? YES! 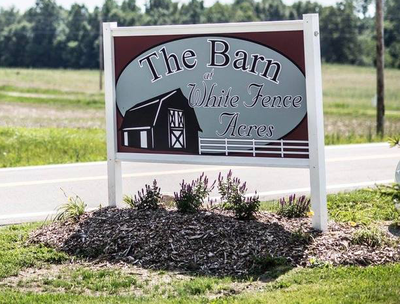 Included in the barn is 13 acres , every bride picks their own favorite spot to get married on the property. Any site you choose will be beautiful! WHAT AM I RESPONSIBLE FOR ?